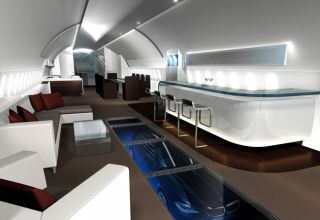 Boeing has developed Boeing 787 VIP interior concepts for customers such as Joseph Lau, announced on May 22 as the customer for the seventh 787 VIP aircraft to be ordered directly from the manufacturer. Hong Kong real estate tycoon Joseph Lau hasordered a Boeing 787 VIP aircraft, the manufacturer revealed today. Boeingvalues the order from the Hong Kong billionaire at $153 million, the currentlist price for the 787 VIP. Lau?s purchase increases to seven the number of 787VIPs ordered directly from the manufacturer. Customers have signed contractswith leasing companies for additional 787s for VIP use. Themanufacturer announced Lau?s 787 VIP order at the European Business Aviation Conference &Exhibition (EBACE) in Geneva. At the show Boeing also unveiled designconcepts for its 747-8 VIP aircraft, which is based on the 747-8Intercontinental (747-8I), the new stretched 747 model that the company isdeveloping. To date,customers?all undisclosed?have ordered four 747-8 VIP aircraft. There are 22earlier-model Boeing 747s in VIP use today. Boeing?sconcept rendering for the 747-8 VIP include features such as vaulted ceilings,spiral staircases and video wall displays. ?With morethan 5,000 square feet of cabin space, the new 747-8 VIP jet epitomizesincomparable luxury and operational flexibility,? said Steven Hill, presidentof Boeing BusinessJets. Incorporatingthe advanced technology of the 787, the VIP version of the 747-8I provides acabin area of 4,786 square feet (444.6 square meters). The new SkyLoft area,located above the main cabin between the upper deck and tail of the 747-8I,potentially provides another 881 square feet (81.8 square meters) of cabinspace, giving owners the opportunity to create unique personal suites, privateoffices and recreational spaces. With theSkyLoft, the VIP-configured 747-8 offers 5,667 square feet (526.5 squaremeters) of cabin space in total. It can carry 100 passengers and fly up to9,260 nautical miles (17,150 kilometers) at a cruise speed of Mach 0.86. Although Boeinghas unveiled interior design concepts for the 747-8I VIP?as it did earlier thisyear for the 787 VIP?it doesn?t design or install interiors for VIP jets. Itdelivers them ?green? without interior furnishings or exterior paint tocompletion centers, where customers work with certified designers to have theinteriors of their VIP aircraft personalized and installed and the exteriorspainted to their specifications.